Quilling is the art of taking thin strips of colored paper, rolling them into a coil, pinching them to form a shape and then gluing the shapes together to create paper designs and objects. Quilling is an inexpensive craft that once you try, you'll be tempted to make your next hobby. All you need is paper and glue to make things that are both pretty to look at as well as stunning in design. The best way to get started if you're new to quilling is to find inspiration. Study quilled art that you like and use it as a springboard for making your own fabulous designs. Pretty soon people will be admiring your work and using it as inspiration for their quilling projects. Experiment and play with different shapes and techniques to create this easy but effective monogram. Once you have your outline, the creative freedom is all yours! This tutorial will introduce you to the six most common quilling shapes. Celebrate the autumn season by sending your friends greeting cards adorned with a beautiful quilled autumn tree. Even if you have never made a quilled craft before, you will be able to create this card in no time! It is merely made of eye-shaped quilled coils to represent the leaves and basic coiled strips to make the trunk of the tree. The simplicity of the design radiates elegance, and the best part is the tree is so easy to make. It's never too early to start thinking about Christmas crafting! 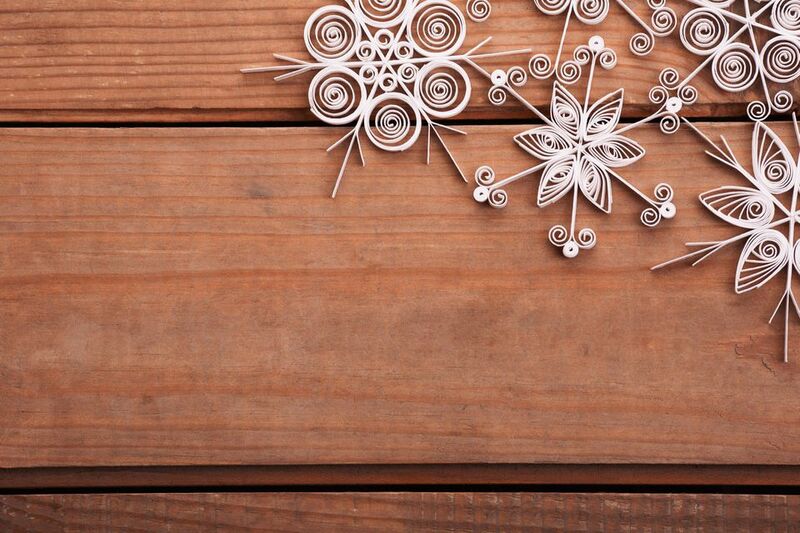 Gather the kids and make these lovely quilled snowflakes to decorate your Christmas tree. They are so beautiful, that you can even use them as inexpensive gifts for people on your Christmas list. Almost everyone will treasure a gift that you made with your hands—it makes the present that much more special. This trendy quilled teardrop vase is a wonderful project for beginning quillers. Just glue teardrop shapes in gradients of color onto a vase. This project can be made in under an hour. Who doesn't love a craft project that's quick and easy, but still looks so upscale! This quilled basket of flowers has a sweet vintage appeal. Frame it for a charming new piece of wall art to hang in your home or to give away as a gift. Kids, and adults too, can make this modern quilled angel in less than 15 minutes. Can you imagine an entire Christmas tree adorned with these angels from top to bottom? It's certainly possible because they are so easy to make. You can quickly craft enough for your entire "Angel Tree" in a couple of hours. Your kids will love participating in this Christmas craft. Who knows—maybe it will become an annual holiday tradition for your family. Make some earrings for yourself or for a gift. Paper Zen shows how to add a golden metallic shimmer to your quilled earrings to give them an extra bit of excitement. The next time you need to make a cake for a special occasion, decorate it with crepe paper kumquat branches interspersed with the cutest quilled daisies. The design was inspired by an Anthropologie window decoration—what a gorgeous upscale look! The quilled flowers are so sweet when tucked into the crepe paper kumquat branches. Paper quilling naturally lends itself to jewelry projects. This beautiful pendant is made up of pink and blue eye shapes around a circle coil. Glue on a pearl and you're done! Little girls will love this project! Quilling can even be used for toy making! Little kids will be thrilled with this paper top craft. All you have to do is make a round paper coil for the bottom of the top, and then build a wall of paper to form the base. Sara Rivka, from the blog the Creative Jewish Mom, says the tops will spin a surprisingly long time if they are made correctly. Are you looking for an inexpensive but but still impressive present to give to someone? This quilled paper frame might just be the craft project for you! Glue quilled flowers around a thrifty frame and you'll instantly have a gorgeous gift. DIY Gift Bags for Any Occasion That are Fast and Easy to Make!